The 24th annual ceremony featured a female host and presenter line-up. At tonight’s Screen Actors Guild Awards, “Three Billboards Outside Ebbing, Missouri” was the most-nominated film of the evening and the most winning, locking up Outstanding Performance by a Cast in a Motion Picture as well one for Frances McDormand and one for supporting actor Sam Rockwell. Only Woody Harrelson — the film’s fourth nomination, and Rockwell’s competitor, was shut out. Gary Oldman won best actor for “Darkest Hour,” as did supporting actress Allison Janney (“I, Tonya”). All are Oscar favorites for nominations announced Tuesday. 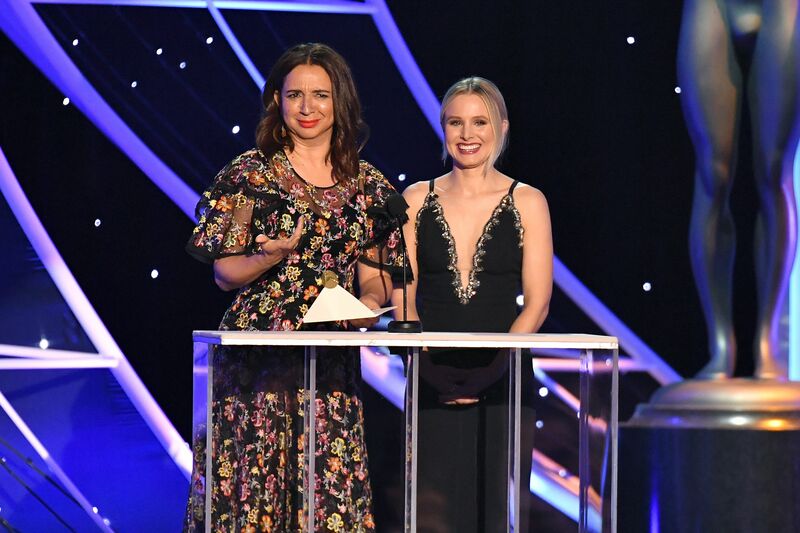 During what was teased as a mini-tribute to her husband, Dax Shepard, Bell instead lavished praise on “Lady Bird” writer-director Greta Gerwig, encouraging her to tell more stories. Lifetime Achievement Award winner Morgan Freeman offered design improvements on the ceremony’s Male Actor bust, which appears genderless from behind. Among the presenters was a tearful Rosanna Arquette, who said Harvey Weinstein sexually abused her at the Beverly Hills Hotel in the early ’90s. “We are inspired that so many powerful voices are no longer silenced by the fear of retaliation,” she said, thanking Asia Argento, Annabella Sciorra, Ashley Judd, Daryl Hannah, Mira Sorvino, Anthony Rapp, and Olivia Munn for speaking out against their assailants. On the red carpet — where there were markedly fewer Time’s Up pins than seen at the Golden Globe Awards January 7— Nicole Kidman revealed that if she could step into any other person’s shoes, she’d choose those belonging to Oprah Winfrey. Kidman later gave the most rousing acceptance speech of the night — her first at the SAGs, for her 10th nominated performance. Despite facing sexual harassment allegations, “Disaster Artist” nominee James Franco attended the SAG Awards. Aziz Ansari, another man recently accused, stayed home. Following the example recently set by the Sundance Film Festival and the Producers Guild of America, SAG-AFTRA announced during the telecast that it will also update its code of conduct in the wake of rampant sexual misconduct allegations in the industry. The union is comprised of 121,000 members, and this year’s nominations were chosen by a randomly-selected panel of 2,500.